Ryanair's schedule has been experiencing disruption of late amid ongoing industrial action by both pilots and cabin crew. Unions have threatened more strike action at the airline in the weeks to come as well. What rights do you have if your flight is cancelled because of a strike? When you book a flight with an airline, there is an implied contract that the airline is responsible to transport you from one specific destination to another. But, Editor at Travel Extra Eoghan Corry says that for most intending passengers, "the idea of a refund is nowhere near satisfactory as they would have booked their summer flights months ago and the refund amount would not be much help in booking a new trip as the cost of flights is considerably higher when booking at short notice". According to the aviation regulator, in the event of a cancellation, passengers must "also be offered care and assistance free of charge while waiting for their rerouted flight – specifically, meals and refreshments in reasonable relation to the waiting time, hotel accommodation in cases where an overnight stay becomes necessary, transport between the airport and place of accommodation and two telephone calls." 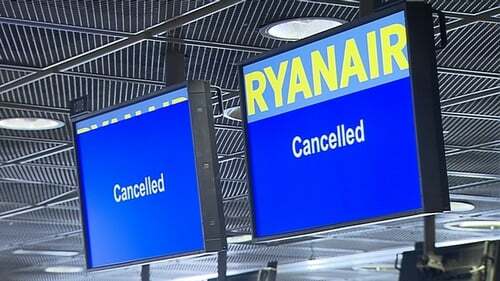 Amid a raft of flight cancellations last autumn Ryanair also managed to re-book many affected customers on other airlines in order to minimise travel disruption. This was a big break with tradition for the carrier, which previously was resolute in not re-booking intending passengers on competitor airlines, but Ryanair has set a precedent by doing so last autumn. Eoghan Corry adds that "intending Ryanair passengers who re-booked themselves in the previous disruption were reimbursed by the airline and there weren't really any issues unless they booked fancy business class". His advice is for customers to wait for Ryanair to communicate any offers to them and accept them "if they are reasonable, because it's a very risky strategy to book yourself and look for reimbursement later". Can I claim compensation from the airline? When it comes to making a compensation claim against a carrier over a cancelled flight, a strike situation is a "get-out clause for airlines", according to Eoghan Corry. "Airlines will fly you as soon as possible to your destination following a tech failure, strike, or weather event" but, he says, there is no automatic obligation on the airline to pay passengers compensation in such a scenario. "Making a claim against an airline over a flight cancellation due to a strike is a grey area." He says in some cases such a claim will be upheld, but not always. The Travel Extra Editor added that the "one-stop shop" for compensation claims against airlines is the Commission for Aviation Regulation. Whether or not a claim is valid will be decided by the Commission, but passengers can still pursue claims through the courts if they have no luck with the aviation regulator. How likely is it that my flight will be cancelled? Ryanair has more than 4,000 pilots working for it across Europe. Many of them are staff and others are contractors and, as Eoghan Corry points out, Ryanair has previously moved pilots around its network to address industrial action and avoid large travel disruptions. The airline does not tend to allow its schedule to be disrupted by unions. "This has already happened. In Italy, there was little or not disruption to Ryanair flights following a pilot strike when the airline brought in pilots from its other bases across Europe - but this was only a small strike. "Ryanair is more than 80% likely to fly in pilots from other bases and use contracted pilots" to offset any strike action." Obviously there has already been some disruption to Ryanair's schedules as a result of the industrial action by Irish pilots, but it has been relatively minimal. But if the strikes escalate, then disruption to passengers is likely to increase accordingly. The European Cockpit Association has never managed to put together a united front on anything when it comes to Ryanair, but this industrial unrest at Ryanair has changed all that. Ryanair has a distinct, unique pan-European business model and this in turn has led to the creation of a pan-European model in the trade union movement. The Irish airline managed to hold out against the influence of unions for more than three decades. It pays its pilots more money than its rivals, which had previously discouraged union participation. For example, "Ryanair pilots earn on average around €20,000 more than their counterparts at Aer Lingus and they have superior rostering conditions," according to Eoghan Corry. Now that Irish pilots have voted to strike, it is likely other unions across Europe will be watching the situation closely, with more possible actions against the airline in other countries coming down the line. "The old Ryanair would have been very hard-nosed in response to union action, but the new Ryanair may not be so hard-nosed in response to this." Despite this, Eoghan Corry says we could be in store for a "summer of antagonism and strike threats" and "uncertainty is a weapon that will be used against passengers".